Since the company’s inception, Walt Disney Studios has produced a plethora of feature films, with some animated cartoons while others live-action motion pictures. In amongst those two categories, the studio has told some original stories in the cinematic storytelling, but has also derivate many either classic fairy tale source material (i.e. Snow White & the Seven Dwarfs, Little Mermaid, Sleeping Beauty, Cinderella, etc.) or adapted from literary novels. Of the latter, Disney has crafted films to entertain its audience viewers by bringing these book stories to life (from page-to-screen). Such perfect examples of this notion are movies like 1954’s 20,000 Under the Sea (based on Julies Verne’s classic) or 1964’s Mary Poppins (loosely based on the novels by P.L. Travers). Disney has continued this “book-to-film” adaptations for many years, including recent endeavors like in 2005’s The Chronicles of Narnia: The Lion, The Witch, and the Wardrobe (based on the beloved children’s book by C.S. Lewis) and 2016’s The BFG (based on the book by Roald Dahl). Now, in the latest installment in adapting popular books into motion pictures, Walt Disney Studios and director Ava DuVernay present the film A Wrinkle in Time, which is based on the Newberry award-winning book by the author Madeleine L’Engle. Does this movie shine bright and reach for the stars or does it get lost within its cosmic understanding of light and dark? Young adolescent Meg Murry (Storm Reid), lives a happy life with her mother Dr. Kate Murry (Gugu Mbatha-Raw) and father Dr. Alex Murry (Chris Pine) and younger adopted brother Charles Wallace Deric McCabe). However, Meg’s father, shortly after he discussed the possibility of using astrophysics to traverse the galaxy in seconds by “wrinkling” the fabric of the space / time continuum, suddenly disappears without a trace. Four years after his disappearance, Meg is misunderstood and bullied at school, causing trouble by fighting back against her fellow classmate Veronica (Rowan Blanchard) and being disapproved by her school principal Jenkins (Andre Holland) and her mother. Unbeknownst to her, Meg’s life begins takes an unexpected change, with the arrival of three otherworldly celestial travels Mrs. Whatsit (Reese Witherspoon), Mrs. Who (Mindy Kaling), and Mrs. Which (Oprah Winfrey), who have come to help Meg find her father. Along with Meg’s classmate, the sensitive jock Calvin O’Keefe (Levi Miller), Meg and Charles Wallace set off with the three Mrs. W’s to track their father’s footsteps across the universe. Eventually, the Mrs. W’s reveal Dr. Murry’s discovery to the children, explain the usage of “tessering” (or “wrinkling” to fold space in order travel great distance instantly and that kids must follow their father’s journey until they encounter a great evil simply known as “It”. With the help of the Happy Medium (Zach Galifanakis), Meg, Calvin, and Charles Wallace are able to locate Dr. Murry on the world of Camazotz, which has been engulfed in an evil darkness. As they journey to Camazotz, the three youths face great challenges of illusions and temptations that “It” prepares for them, while Meg’s personal baggage of issues of identity and self-doubt weigh heavy on her heart, casting an uncertain light on whether or not the group will be successful in saving Dr. Murry and make it home safely. It’s not uncommon for studios to select a book (be it best-selling, or beloved literary classic) to be adapted for the big screen as a full-length feature film. Why? Mostly because it’s the novel’s story has proven to work to the masses and is ripe for the picking to be brought into a new entertainment medium (i.e. to be made into a movie). Disney Studios is not stranger to doing this and (by and large) succeeds in a lot more than it fails in these endeavors. 1964’s Marry Poppins stands as a testament to that endeavor, standing as not just as a classic within Disney’s catalogue of feature films, but as a beloved classic in film. As I stated above, Disney continued that trend in adapting and reimagining with such whimsical young readers books like The Chronicles of Narnia: The Lion, the Witch, and the Wardrobe (a movie that I extremely love and cherish) as well as 2007’s imagined and heartfelt Bridge to Terabithia (based on the book by Katherine Paterson). Although sometimes they do falter, such is the case with 2016’s The BFG, a film that was critical praised to due its source material and for its visual effects, but failed connect to its modern audience of moviegoers as the film barely made its money back was the lowest grossing Disney movie property in 2016. Still, Disney presses onward with bringing books-to-film installment, hoping to capture a cinematic medium with its storytelling motion pictures. This brings me back around to the present with my review for A Wrinkle in Time, Disney’s latest endeavor of bringing beloved literary novels to life through a cinematic lens. I do have to say that this. Yes, I’ve read the L’Engle’s book. However, to be honest, I read it just before I saw the movie and (to be truthful) I should’ve read a long time ago as I really did enjoy it. It’s definitely a classic (one that many school systems use for class reading or summer reading) and does feel like a good wholesome book for young readers out there, especially since L’Engle published the book back in 1962 and carried a lot of thematic messages and meanings within its story. I also have to mention that this isn’t the first attempt that Disney has made into adapting A Wrinkle in Time, with their first attempt being a TV movie back in 2003, which starred Katie Stuart, Gregory Smith, Kate Nelligan, Alison Elliott, and Alfre Woodward. I actually did see this movie (immediately following the 2018 version of A Wrinkle in Time) and I thought it was fairly good. The visual effects were, of course, mediocre and dated, but the acting was good and L’Engle’s story was still there. Anyways, back to the 2018 version, I was immediately taken when the film’s cast was announced (Witherspoon, Kaling, Winfrey, Pine, Galifanakis, etc.) as well as seeing the film’s trailers, which gave me goosebumps every time I watched them, especially when hearing the remake of Eurythmics’s “Sweet Dreams” performed by Mark Hadley feat. Dresage. With a lot of excitement in the air about this movie and being heavily promoted through various marketing campaigns, including being mentioned during the 90th Academy Awards, I personally was excited to see this and gave me that extra “push” to actually read the book. Heck, I even placed A Wrinkle in Time on my Top 15 Most Anticipated Films of 2018 (I placed it on as #10 on the list). So, what did I think of it? Was it worth the hype? Sadly (and unfortunately), it does not…in a big way. Despites its source material pedigree, a famed director, recognizable big-ticketed actors and actresses, and a large budget, A Wrinkle in Time fails to deliver, meandering through messy journey from start to finish that lacks substance, clever / sharp dialogue, and meaningful cinematic entertainment value. Suffice to say, the movie’s ambition exceeds its own and never quite lives up to its inherit hype and potential. A Wrinkle in Time is direct by Ava DuVernay, who’s previous directorial works includes the academy-award winning film Selma as well as For Justice and 13th. Given how Selma was well-received by viewers and critics (a feature film based on the 1965 Selma to Montgomery voting rights marches), DuVernay was one of the most sought after African-American directors in Hollywood. They’re were even rumors that she was eyed Marvel Studios for Black Panther (Ryan Coogler won that seat) and Lucasfilm for directing one of the recent Star Wars films, though she didn’t end up directing neither of them. Still, DuVernay gaze look towards Disney and soon fell upon bringing Madeleine L’Engle’s beloved A Wrinkle in Time to life. DuVernay takes several poignant stances when approach the source material and ultimately crafting a feature film. The most obvious one, which is the most noticeable, is the diversity within the cast that represent the characters in the film. Rather being casted and played by Caucasian (aka “white”) actors and actresses, DuVernay makes the decision to make the Wrinkle in Time characters a mixture of different races. This is clearly defined in the Murry family, which is portrayed as a mixed-race family (i.e. Meg and her mother Kate are African-American, while her father Alex and Charles Wallace are white). This is even further extended to the three Mrs. Ws, who are played by white actress, an African-American actress, and an Indian actress. It’s bold move to do, but it’s a move that really does work well and speaks volumes, especially in this day and age where mixed families and relationships are more commonplace as well as Hollywood’s controversial “whitewashing” some of its minority / ethnic characters in the movies. Additionally, DuVernay, being a skilled director, brings to the forefront of the feature a lot of ideas and concepts that may have been challenging to a less experience director. In that regard, she succeeds, especially in bringing the universal themes and messages like self-identity, the power of love (cheesy as it sounds), and the importance of family. Also, the themes of good and evil (aka light vs. darkness) is also presented in the film (as somewhat classic notion in kid movies) as DuVernay handles that notion well. On a visual and technical level, A Wrinkle in Time is a feast for the eyes and is definitely one of the most positives things about the movie. It goes without saying that the visual effects team (and art department) who worked on this movie should be commended for their work. The various alien-world scenes and vistas (most notably on the beautiful and colorful planet Uriel) vibrant and distinct with a lot creativity put into them. I literally fell in love with the whole Uriel sequences as well as lot of the effects that showed the group “wrinkling” space / time through tessering. 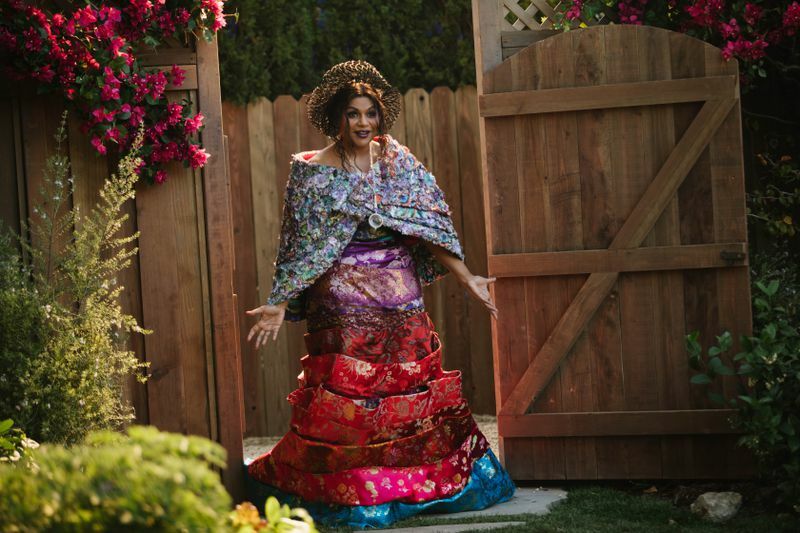 Additionally, the costume designs by Paco Delgado and the entire hair and make-up team should also be praise for their work on A Wrinkle in Time, especially in the various outfits and facial make-up for the three Mrs. Ws. Lastly, the film’s musical score, which was composed by Ramin Djawadi, is exceptionally good, with a lot of melodic flourishes and sweeping orchestral music to invoke a sense of child-like wonderment and awe-inspiring moments. All in all, A Wrinkle in Time is beautifully rendered, which makes it even harder to now talk about all its disappointments. As I said, I was really looking forward to seeing A Wrinkle in Time, but the film’s finished product was far less desirable than what I was hoping (and expecting). Perhaps the biggest problematic complaint would have to be the awful screenplay. The film’s script, which was penned by Jennifer Lee and Jeff Stockwell, lacks a sharpness in its dialogue and transforms L’Engle’s story into a mish-mash narrative that doesn’t really work quite as well. What do I mean? For starters, the movie jumps right into the main event by introducing the Mrs. Ws, but its done in such a brisk and fast-paced way that it very jarring and perplexing. Naturally, those who have read L’Engle’s book will be able to follow this, but, to the uninitiated in A Wrinkle in Time’s story, it might be a little bit too comprehend, especially since this is supposed to the introduction to the narrative’s main plot as this could make a non-reader of the book loose interest in the movie altogether. Coinciding with that idea, the movie moves at such a brisk pace and never takes to stop and the smell roses (I had to put that in there). What I mean is that the DuVernay keeps the movie on a straight and narrow path and doesn’t allow either the film nor its characters to stop at a particular moment and reflect on events or even character-building moments. This, of course, hurts the movie itself and even hurts the character building, which makes a lot of them generally flat (but more on that below). Thus, the movie goes from one plot point to the next and doesn’t stop. To be honest, the film itself seems extremely choppy as if huge chunks of the movie were taken out in order for it to clock under the two-hour runtime (A Wrinkle in Time as a runtime of one hour and forty-nine minutes long). Another problem is in the film’s world building. 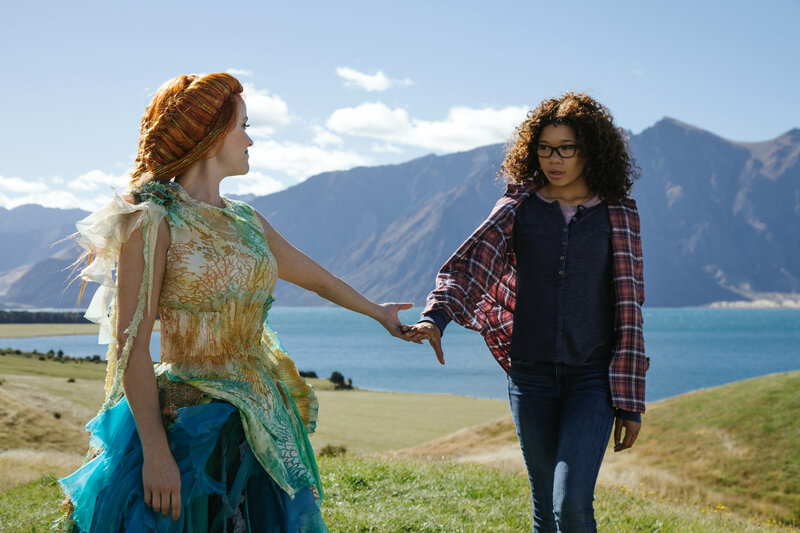 Taking from its source material, A Wrinkle in Time blends whimsical fantasy and high-concept science fiction together, though the end result is far from being cohesively entertaining. In truth, the idea of three Mrs. Ws, the rescue mission of Dr. Murry, and the Meg (and company) journey to fight against an evil darkness is a lot to take in and does require a lot of world-building, especially since the narrative explores different worlds across the universe. Unfortunately, DuVernay fails to capture that notion and does so by breaking a cardinal rule in moviemaking, which is to “tell” its viewers what’s going on rather than “showing” its viewers. This, of course, means that A Wrinkle in Time has a lot of expositional scenes of characters talking about things and more thing and even more things, with not a lot of action or even drama. This also further leads into the film’s third act, which is where a lot of poignant and meaningful moments happen during the movie’s climax. Unfortunately, what’s suppose to be a defining moment for Meg (and for the movie itself) falls flat on its face. The climatic ending is extremely rushed and literally undermines the showdown between Meg and IT. I was so disappointed by it and was like “That’s it. That’s climatic final battle”. Even the film’s ending, which sorts wraps everything up, feels underwhelming and doesn’t feel earned as if L’Engle’s story and us (the viewers) are cheated by the film’s hodgepodge resolution. Given the complexity of the story and its world-building ideas and concepts, DuVernay could’ve easily added an additional 10 or 15 minutes to make the film “breathe” and further expand on certain moments to make the feature (be it plot points or characters). Unfortunately, this did not happen. It’s as if DuVernay (as well as Lee and Stockwell) are so busy in trying establish the film (and its colorful imagery) that they fail to make a natural flowing and cohesiveness of a feature film. It’s as if the movie is so in love with L’Engle’s central plot that it disregards a lot of common filmmaking tactics. Then there’s also the film’s dialogue, which is incredible dull, clumsy, and clunky. Yes, I do know that A Wrinkle in Time is derivate from a young readers book and that the film is made (and geared towards) young tween viewers, but the movie’s dialogue is so incredible bad and clunky. Naturally, some of its is masked by some performance (mostly the seasoned actors and actresses), but it’s hard to deny that terrible dialogue written that will most certainly roll your eyes or even laugh at it (I certainly did). Then there’s extreme close-up camera angles. While I do praise Tobias A. Schilessler for his cinematography on the film, DuVernay’s decision to push widely in on characters face for extreme close-ups is overutilized in the movie. It’s good for a couple of moments, but for almost every single character scene…. then it becomes quite annoying and distracting. I literally cringe every time that movie did that with the character of Meg as you would see Storm Reid’s nostril wiggle up and down from breathing. Also, while I do praise DuVernay for tackling strong theme and sincere messages, she does so in way that quite heavy-handed and too much “on the nose”, which takes away from A Wrinkle in Time’s allure. Heck, she even takes out L’Engle’s Christianity overtones in the narrative. However, she still keeps the idea of “conformity” in the central plot. Lastly, before I forget, the movie also ultized several pop songs in the feature, but it ultimately backfires and takes away from the more whimsical fantasy journey that Meg and company are on. In fact, it more felt like TV movie when those songs were being played, which further drives the nail in A Wrinkle in Time’s coffin. Much like what I said in a few paragraphs above, A Wrinkle in Time’s cast is diverse and does makes a statement with each individual being their respective characters. Naturally, the movie’s “big-ticketed” stars are mostly delegated to supporting roles, while the three kids (Meg Murry, Calvin O’Keefe and Charles Wallace are given the spotlight as narrative’s three main protagonist characters. At the head of the group is young actress Storm Reid who plays the true main hero of A Wrinkle in Time Meg Murry. Known for her roles in 12 Years a Slave, Sleight, and Lea to the Rescue, Reid is given the most compelling and well-rounded character arc in the entire film, cultivating Meg as the “chosen one” architype to defeat the darkness and find her father. However, I didn’t feel that Reid was particular right for Meg as her acting ability was quite that great, especially in a film’s lead role. She has the poise and stance of previous child stars (in the classic “hero” role), but she just seems to lack weighty theatrical talents to fully embody Meg Murry, especially when the character is called upon to give dramatic moments. To be honest, a lot of her characters moments is just her reacting to things and speaking dialogue of her reacting to those particular events. In the film’s ending, which is where Reid’s Meg is supposed to shine the most, feels lackluster in her performance. So, in a nutshell, the character of Meg has well-developed (albeit) character arc in the movie, but is weighed down by Reid’s inexperience of make her character come alive and making it her own, which is extremely disappointing. The two others that tagalong with Meg on her adventure are the characters of Calvin’s O’Keefe, a nice-guy jock in Meg’s school, and Charles Wallace, Meg’s intellectual gifted adopted younger brother, who are played by actor Levi Miller and young actor Deric McCabe. Miller, known for his roles in Pan, Better Watch Out, and Jasper Jones, acts as a companion to Meg by supporting her and believing in her. Miller’s overall performance is fine, but there’s really no depth to him. He’s basically just a nice boy-next-door type architype that lacks weight beyond his surface level. There’s an important part of his home life that’s revealed in the movie, but there’s no much resolution that point or even to his character by the time the movie ends. He’s basically just along for the ride….and that’s it. There’s a semi-romantic subplot between Meg and Calvin, but it just seems half-baked and only partially works due to charm / dynamic of Reid and Miller. However, perhaps the weakest (of the three) has to be McCabe’s Charles Wallace. Known for his roles in XXIII Boss (short film), Stephanie, and Hold On, McCabe becomes increasingly annoying throughout the film and is literally a “cog in the machine” to drive the narrative’s story exposition and a somewhat instigator of plot progression. His character is given more to do within the last act of the feature, but it just comes off as too comically campy and odd due to both McCabe’s acting ability and through the time constraint on the third act. Basically, he’s only important in the first act (the first ten minutes) and the ending, becoming completely forgotten during the film’s second act. With the movie primarily focusing Meg, Calvin, and Charles, the supporting players in A Wrinkle in Time aren’t even quite enough screen-time to project their characters (as a whole) to us (the viewers), which makes them flat and underdeveloped. However, most of these performance (if not all) are represented well enough merely do the screen presence of the actor / actress that portrays them. This is notion is clearly defined within the three Mrs. Ws (Mrs. Whatsit, Mrs. Who, and Mrs. Which), who play as the mentoring / guiding astral beings that guide the three children on their journey. Of the three, actress Reese Witherspoon (Legally Blonde and Wild) is given the most screen-time and is also granted the most personality as the bubbly / fast-talking Mrs. Whatsit. It’s also clear that Witherspoon seems to be having the most fun in the role than any cast member, which makes her presence (both her as an actress and her character) memorable in the movie. Behind is actress Mindy Kaling (The Mindy Project and Inside Out), who is given not much to do with her character of Mrs. Who than to spout random quotable line for most of the film, which makes her the most underused of the three Mrs. Ws. Her acting is fine in the movie, but her character will mostly be remembered only on by the lavish / stylish clothing she wears as Mrs. Who. Unfortunately, famed celebrity icon / former talk-show host Orpah Winfrey (The Princess & the Frog and Lee Daniel’s The Butler) is pretty much a one-not stock mentor character role as Mrs. Which, for both the three children and to the two other Mrs. Ws. She definitely has the strongest presence of anyone in the film and does so whenever she’s on-screen, but she has little to in the film beyond being the “obi-wan” archetype by offering encouragement and wise words. Again, her acting is fine, but Winfrey’s performance will be only be remembered in A Wrinkle in Time merely do her starring in the film and not by her character of Mrs. Which. Rounding out the cast are several notable that either serve to frame the story’s edges or have small roles within one or two sequences. This includes Meg’s two parents, with actress Gugu Mbatha-Raw (Concussion and The Cloverfield Paradox) as Dr. Kate Murry and actor Chris Pine (Star Trek and Wonder Woman) as Dr. Alex Murry being more developed side characters than three Mrs. Ws. Both Mbatha-Raw and Pine give great performances for their relatively small roles in the film and offer a minor compelling anchor for this movie’s story, which is mainly focused on Meg, Calvin, and Charles Wallace adventure out in the cosmos. Other notable actors in the film include comedian actor Zach Galifanakis (The Hangover and Baskets) as the eccentric spiritual being known as “The Happy Medium”, actor Michael Pena (Ant-Man and The Martian) as the red-eyed telepathic agent of IT who is simply called “Red”, actress Rowan Blanchard (A World Away and Girl Meets World) as Meg’s next-door neighbor / fellow classmate mean girl Veronica Kiley, and actor Andre Holland (American Horror Story and Castle Rock) as Meg’s principal Jenkins. Meg Murray, Charles Wallace, and Calvin O’Keefe embark upon an adventure through space and time (guided by the celestial Mrs. Ws) to find Meg’s father in the movie A Wrinkle in Time. Director Ava DuVernay newest film takes Madeleine L’Engle beloved award-winning book and brings it to the big screen, offering up a visual feast for the eyes within its scope as well as bringing a endearing strength of female empowerment as well as diversity within actors and actresses chosen for the film’s characters. Unfortunately, while film’s visual and technical presentation is huge positive selling point and the story has a strong universally messages, the movie can’t overcome its extremely clunky dialogue, it’s uneven flow, underdeveloped characters (both major and minor), inexperienced acting, perplexing narrative stances, confusing plot holes, and rushed (and lackluster) ending act. To me, I was disappointed with this movie. It definitely has all the right pieces, but how the movie was handled (through all its negative points) left such an unsatisfying aftertaste. I really have little to no desire to watch this movie again, which is really disappointing to me, especially since I was really looking forward to this movie. 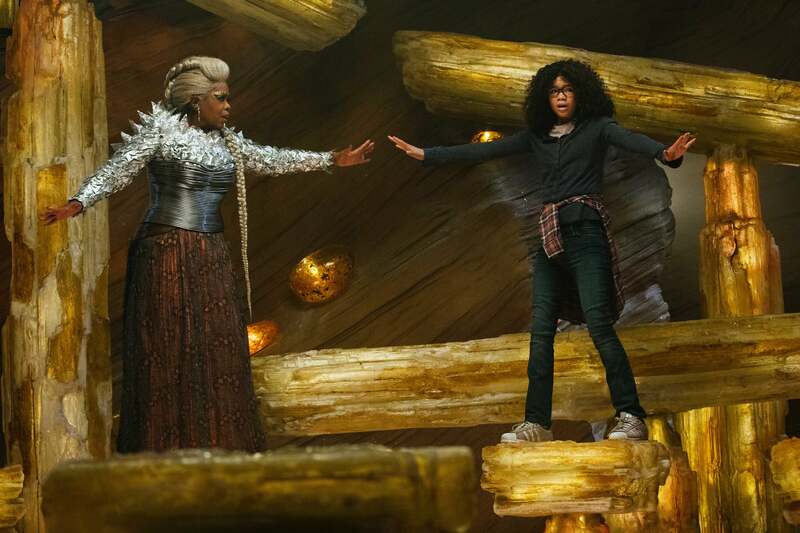 As many early reviews for this movie have stayed, A Wrinkle in Time is mostly geared towards kids, so young viewers will probably get more mileage out this movie than teens or adults. However, there are far better features films out there that carry the necessary weight of translating books to film and have a more equally balance of narrative structure and cinematic presence than this movie did. Thus, my recommendation for this movie is a definite “Skip it”. Sadly, DuVernay’s A Wrinkle in Time, despite its inherit hype and its pre-release anticipation, will go down as disappointing endeavor than a successful one. Some movies reach for the stars and achieve cinematic greatness, but A Wrinkle in Time fails to do so, providing a beautiful but messy and underwhelming kid’s fantasy adventure. Nice review as always. I’m not overly surprised with the verdict though — something about this film struck me as ‘off’ since the trailers. Thanks! I was really hoping that this movie was going to be good. Sadly, it didn’t pan out even remotely good, with the exception of the film’s costume and make-up. Trailers never did a thing for me. The tone just didn’t seem right and in this case, the visuals and the score (I like Ramin) aren’t going to be enough for me to view in theaters. I even had a screener to check this out and I just couldn’t get excited. There’s no shortage of takes on this so I’ll let others (like yourself, nice piece as always) take the reigns on this one. Haha….see trailers usually do it for me. I watch them so much, which helps me build my anticipation to see the movie. However, this movie backfired on my expectations as the film was so disappointing. I would like to see it just for the CGI, even though the movie doesn’t seem like I’d enjoy it all that much. But after reading reviews like this, I’ll avoid it for sure. I’ve not seen anything good said about it yet. The CGI might be cool enough to suffer through so I could take the kids, but the PG rating leaves out that option. So I guess this is one I’ll be passing by.